On Wednesday March 6, a delegation from the central Asian country of Kyrgyzstan visited IONA to learn about conflict resolution Delegation from Kyrgyzstan visits IONA 01and community relations. Their visit to the US (March 1 –March 9) was part of The Open World Program which is a non partisan initiative funded by the United States Congress to build mutual understanding between emerging leaders of participating countries and their U.S. counterparts. Reverends Dan Buttry and Barbara Clevenger from the InterFaith Leadership Council of Metropolitan Detroit (IFLC) joined Ameer Mustapha Elturk from IONA who is also the treasurer of IFLC in welcoming the delegation. The delegation was led by Judy Kebl from the International Visitors Council of Metropolitan Detroit. Its members were Mr. Kanatbek Abdyraimov, Mr. Denis Vladimirovi ch Pyshkin and Ms. Gulnaz Isayeva who’s titles are Inspector for the State Commission on Religious Issues. The delegation had nongovernmental members also. Ms. Gulmira Khalmatova, a teacher at an Islamic school, a village Imam Mr. Kayymbek Zheenbayev, and Mr. Ulan Shabynov who is a Youth Program Director and an Open World Facilitator. Samir from Chicago was one of the translators. Only 2 members of the delegation spoke English. We were later joined by other IONA members, Ali Al-Katib (Treasurer), Waheed Rashid (General Secretary), Dr. Munawar Haque (staff researcher, editor, and writer), and William Antoun (Assistant Outreach Director). The delegation talked about the ethnic clashes in 2010 between Kyrgyz and Uzbeks and the fallout from these that still exist. The government was Delegation from Kyrgyzstan visits IONA 02 criticized by outside observers as not doing enough to quell the tensions that still exists between these two ethnic groups. 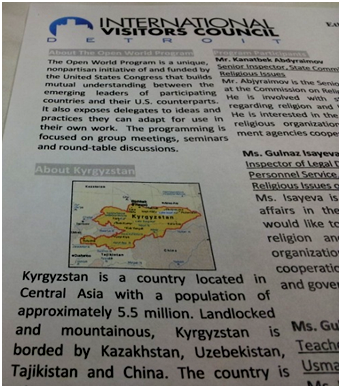 Their task was to learn how these issues are dealt with in other countries so that the Kyrgyz government can better address them in the future. They also asked questions about Islam and how Muslims function in America especially with a diverse ethnic community like IONA’s. Ameer Mustapha articulated the challenges he overcame to establish the masjid and to bring and maintain the different immigrant Muslim groups as well as the indigenous Muslims. Rev. Buttry, who travels and had been to Kyrgyzstan, shared his mission of conflict resolution among ethnic and religious groups. Rev. Clevenger shared the challenges the interfaith community faces. She shared the quick response and unity that came in the wake of Pastor Terry Jones who wanted to burn the Qur’an. There was a discussion on the growing number of people accepting Islam not just in America and the West but surprisingly in the East also. Muslims in the former Soviet countries are re-learning their faith, Islam. Denis, a member of the delegation, was ethnically Russian had been raised Orthodox Christian and after accepting Islam his parents followed his path and embraced Islam. Everyone enjoined a great lunch of Lebanese food from a local restaurant and our guests were quite pleased. They left with a better understanding of Islam in America and how to deal with diversity issues.